Published Jul 10, 2015 by Que. Part of the LiveLessons series. Learn how to prepare your data for exponential smoothing and how the accuracy of forecasts can be quantified. Optimize your forecasts using Excel's Solver add-in, and learn to interpret smoothing analyses presented in various sources. Understand the differences between stationary, cyclic and trended baselines, and how autocorrelation helps you characterize baselines. Use regression analysis to support smoothing forecasts, and evaluate forecasting models by analyzing residuals. Detrend and forecast baselines using first differences. Use standard methods to initialize forecast values, and backcast prior to the first period in a trended baseline. Companies of all sizes are turning to exponential smoothing to accurately forecast trended data such as sales, demand, and other key business indicators. 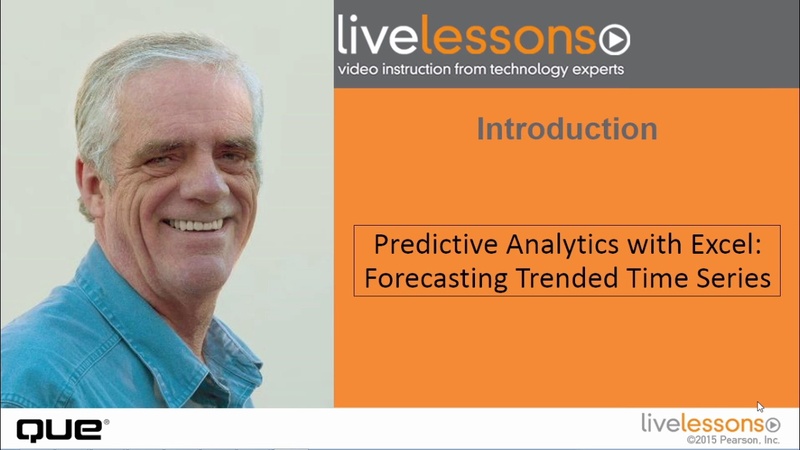 In this video course, world-class analytics expert Conrad Carlberg shows you how to use smoothing to forecast trends with a tool you already know: Microsoft Excel. Carlberg illuminates each technique through easy-to-follow video, with crystal-clear explanations reflecting his decades of experience solving complex analytical problems with Excel. You’ll learn how smoothing works and how to prepare data; quantify a forecast’s accuracy; use Excel Solver to reduce forecast error; interpret smoothing analyses; work with baselines; support your forecasts with regression analyses; diagnose trends using autocorrelation; detrend and forecast from a trended baseline; initialize forecast values; and backcast beyond the start of your baseline. You’ll learn hands-on through practice workbooks provided for your own use and adaptation. By the time you’re done, you’ll have mastered one of today’s most valuable predictive analytics skillsets—one you can use in nearly any field of business.